aww that just makes my heart melt! She is too cute. Dag-nabbit – makes me wish Samson’s puppy days. Dette: Other than her being small and adorable, I don’t miss her puppy days either. She’s 4 now and still quite puppy-like, but it’s at a more manageable level now! 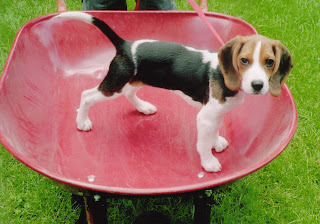 Are you trying to start an adorable beagle picture war with me? Cuz if you are, just know that I’m all thumbs with a camera. Previous post: Birthday Fun: It’s Not Just For Breakfast Anymore.